All southbound lanes on the Benicia-Martinez bridge were closed Friday after a man claiming to have a bomb threatened to jump. The 54-year-old Rodney Brinckerhoff was detained around 9 p.m. as the Walnut Creek Explosive ordinance team concluded there was no bomb. 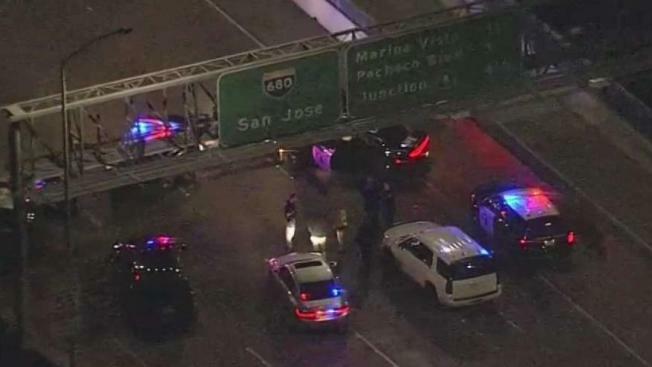 All southbound lanes on the Benicia-Martinez bridge were closed for about 4 hours Friday night as police and a bomb squad searched through a suspect’s car to make sure no explosives were on board, according to the California Highway Patrol. Officials said a possible jumper claiming to have a bomb shut down the bridge's southbound direction around 8 p.m. The subject, identified as 54-year-old Benicia resident Rodney Brinckerhoff, was detained around 9 p.m. after crisis negotiators were able to convince him to give himself up. However, the bridge remained shut down while "an explosive ordinance device team" determined whether a bomb existed or not before eventually clearing the scene around 12:20 a.m. Saturday. "Then the Walnut Creek Explosive ordinance detection team ... concluded that no bombs or ordinance were present and declared the scene safe," Contra Costa CHP officials said in a Facebook post. Brinckerhoff was arrested and the Contra Costa CHP will conduct an investigation. In addition to CHP officers, deputies from the Contra Costa County and Solano County sheriff's offices responded to the scene. View NBC Bay Area's traffic map for latest conditions.